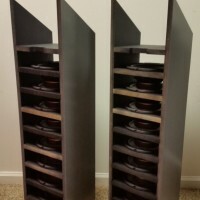 The Hurricanes are a multi-woofer open baffle 3-way tower speaker with a non-traditional woofer mounting strategy that results in as much bass radiating area as two 15″ woofers packed into an average sized tower speaker. 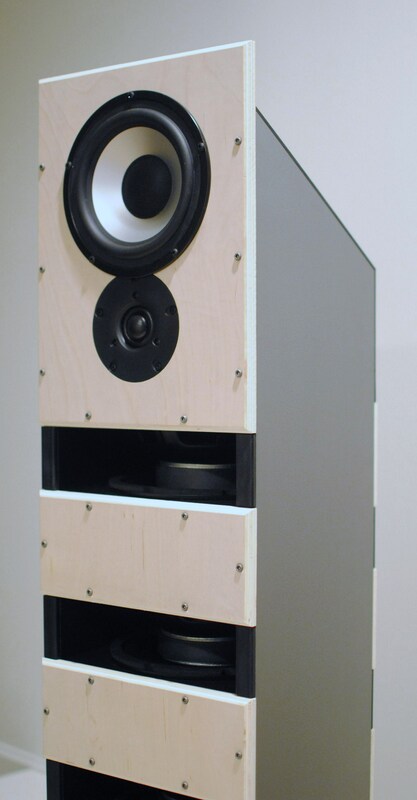 In the last few years, I have heard some great open baffle speakers and have been particularly impressed with the bass from these speakers, considering the limitations of the open baffle format. 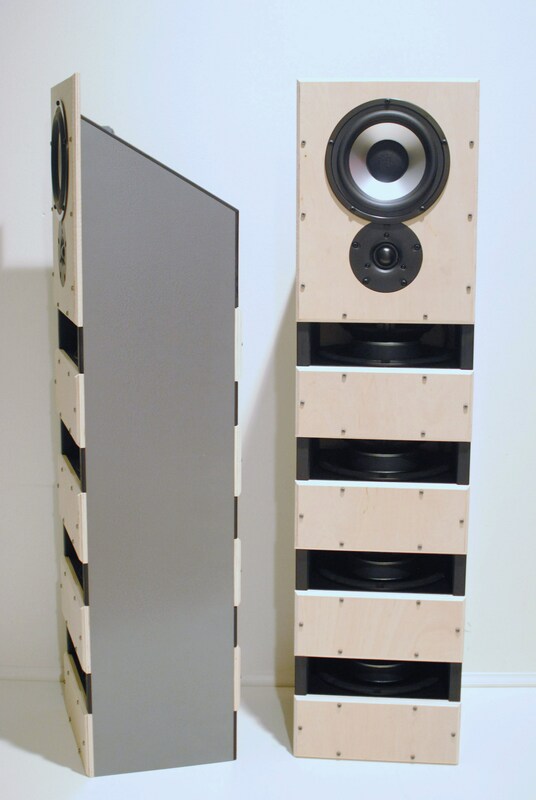 Inevitably, the speakers housed at least one, but usually two, giant woofers on a giant baffle, which would not be a reasonable compromise in my smallish listening room. I wanted to see if I could squeeze all the open baffle goodness I was hearing into a more traditional sized/shaped speaker. As it turned out, I had a lot more leeway in driver selection than I initially thought due to the surprise advantages of the slot loading. At the time however, I chose the driver I did as follows. The woofer was the trickiest choice because it needed to fulfill a lot of potentially conflicting criteria. 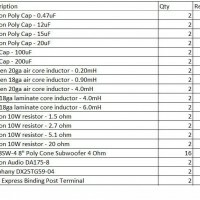 Ideally, it would have a high Qts, low Fs, high Vas, large Xmax, and, most importantly because I would need 16 of them, low cost. 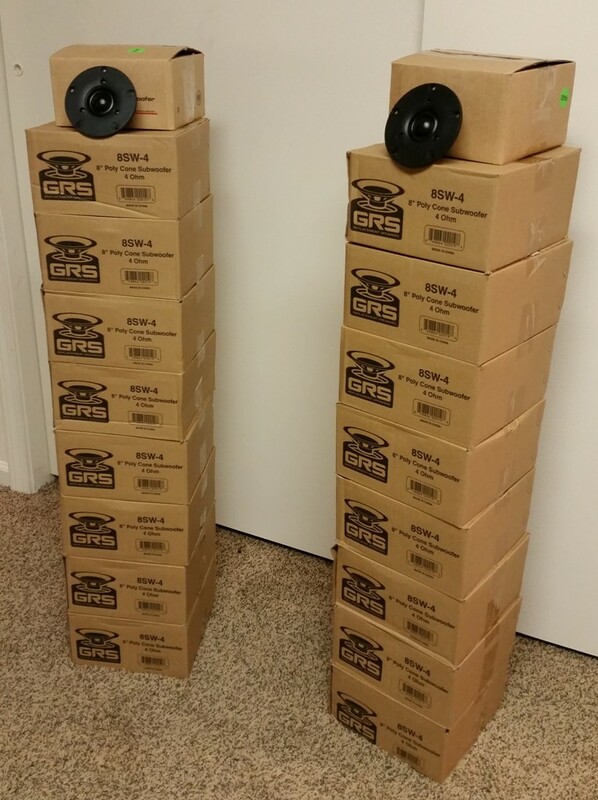 The best fit that I found was the GRS 8SW-4, which nailed the cost component, did pretty good with Qts and Xmax, and not great with Fs and Vas – overall a very good compromise to try this format. 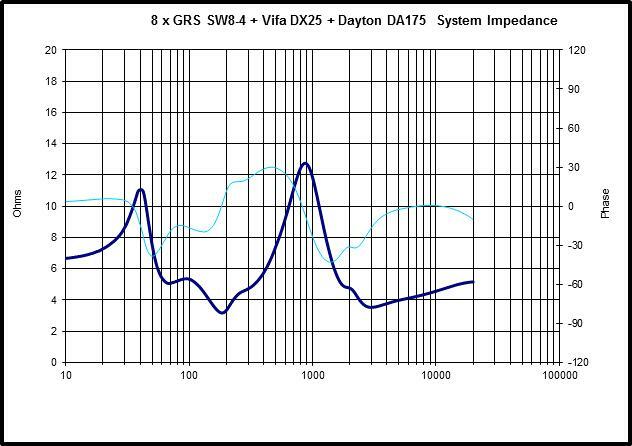 The Dayton DA175-8 was chosen for the midrange due to its proven performance and relatively high Qts/Fs ratio. 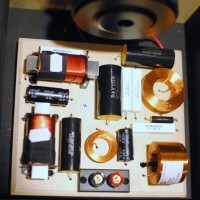 The Tymphany DX25 tweeter was chosen for its low Fs to give me some freedom in crossover point if the dipole peak on the midrange proved to be challenging. 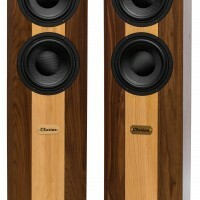 The price point for the mid and tweeter was in line with the woofer choice as well. 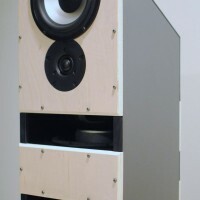 The idea with this design was to mount woofers cone-to-magnet, stacked vertically, with adjacent pairs wired out of phase to compress the air in small slots, which are exposed alternately to the front and back of the speaker. I realize that’s a mouthful, but looking at the picture will help. 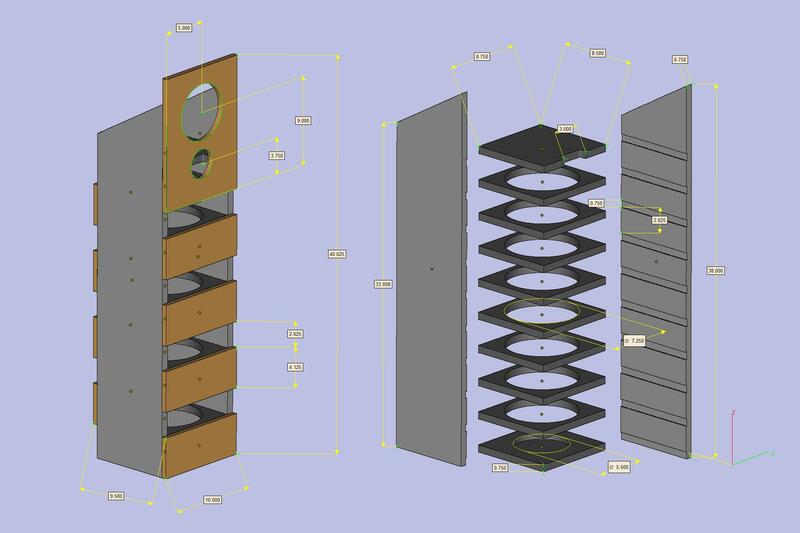 Basically all the slots on the front will compress the air at the same time while the slots on the back rarefy the air, effectively the same as a traditional open baffle speaker would do. In order to maintain a good overall size, I decided on 8 woofers mounted as close together as possible. 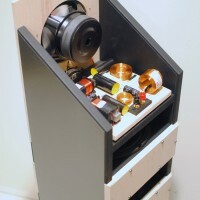 This means that the magnet from one speaker is actually well within the cone cavity of the next woofer. 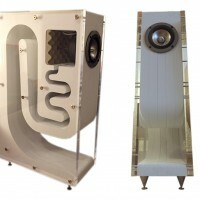 The midrange is operating in free air as well, but mounted in a more traditional way. 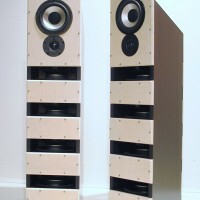 The tweeter was mounted below the midrange in order to keep the overall height to around 40″. This arrangement allowed me to make use of the space in the top woofer slot. 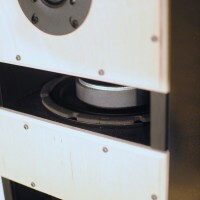 The tweeter is flush mounted, but I chose to surface mount the midrange and slightly overlap the tweeter flange. This was mostly for aesthetic purposes, but it does allow for decreased CTC distance and decreased height as well. 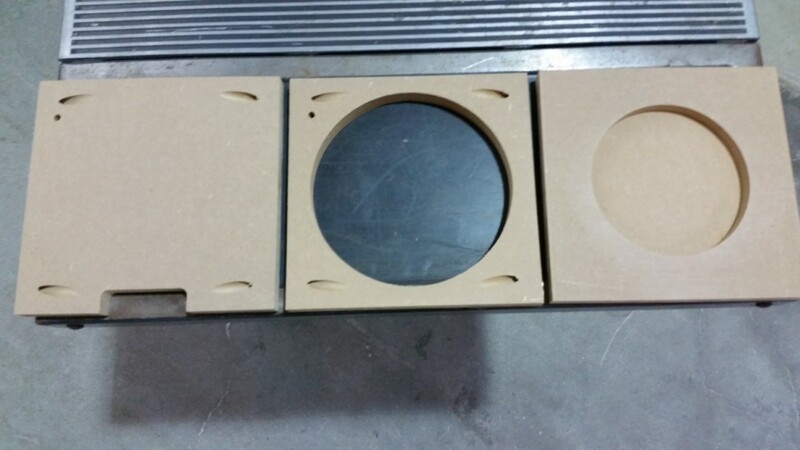 There is a relief notch in the top panel for the tweeter magnet as well as a 5.5″ diameter, 0.5″ deep relief hole on the top of the bottom panel for the bottom woofer magnet. Also a wire pass through hole must be drilled into each horizontal panel (except the bottom panel). 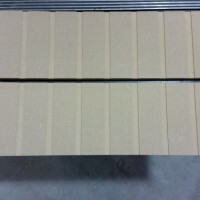 I chose 3/4″ MDF for the sides, top, bottom, and middle panels for cost and ease of painting. 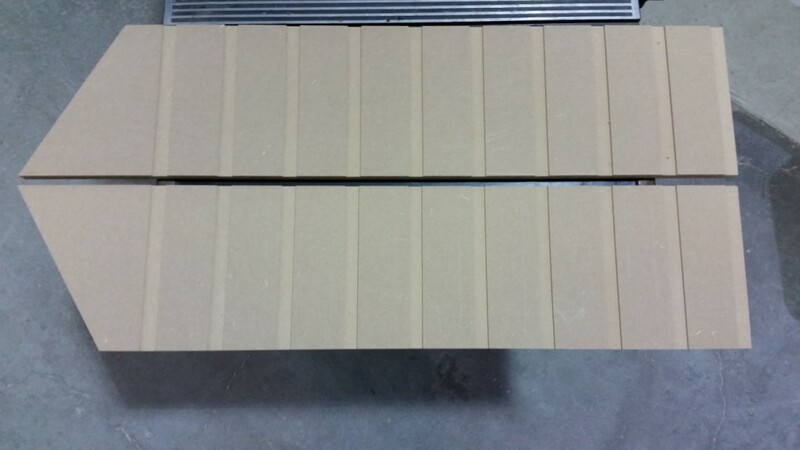 Front and back panels are 1/2″ birch plywood because it looks cool. 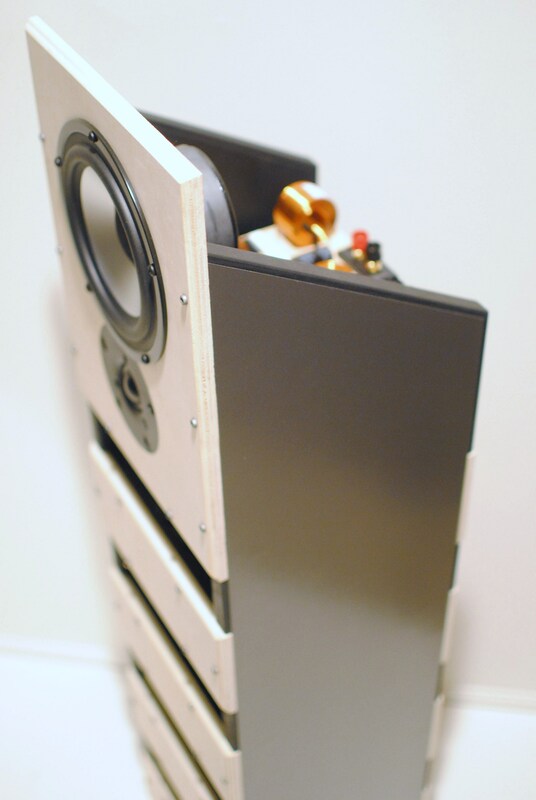 Since there is no “inside” to this speaker, I decided to make the crossover a feature and mount it on a piece of 3/4″ plywood on the top panel behind the midrange. All soldering was done on the backside of the plywood board for a cleaner look. 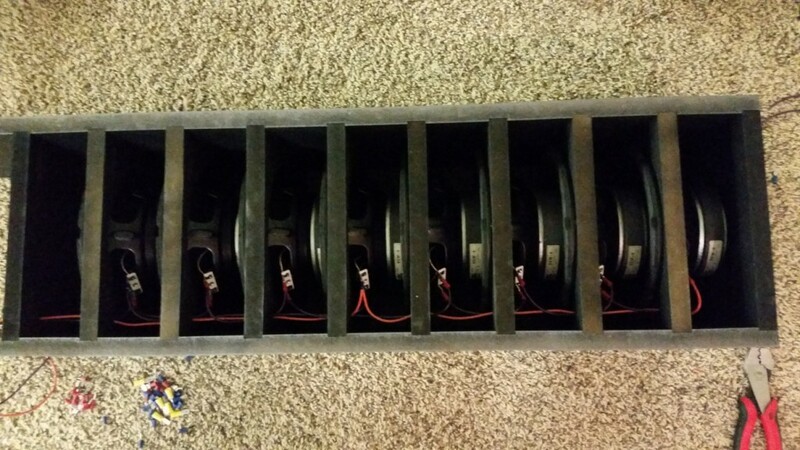 One of the challenges of this enclosure is that the woofers are completely inaccessible once assembled. 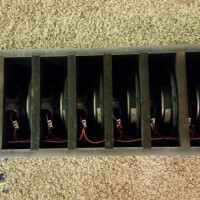 If a woofer blows or someone sticks a finger through the surround, there’s no replacing it without taking the whole thing apart. With that said, I decided that I would not glue any of the panels together to retain access, albeit inconvenient access, to my woofers. So I drilled pocket holes on the bottom of all the horizontal panels and screwed them in place once set in the dado slots. 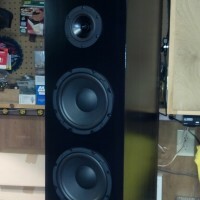 Keep in mind, screwing them together can only be done after the panels are painted and the woofers mounted!! 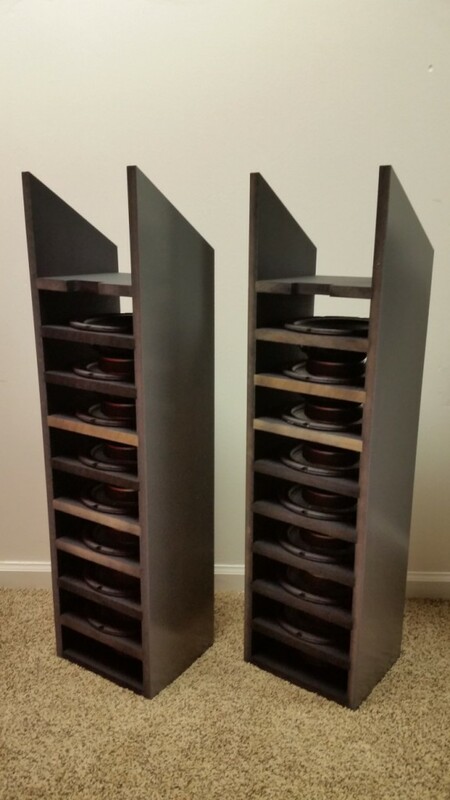 I used a grey hammered finish paint on the outside of the side panels and flat black on the horizontal panels and the inside of the side panels. 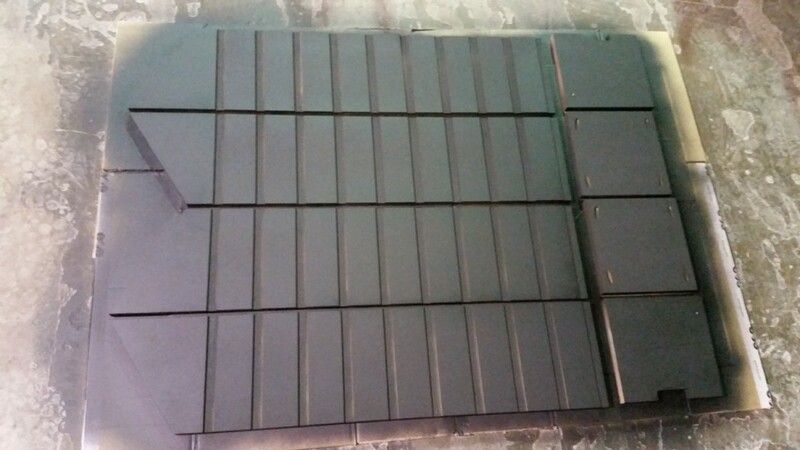 After the side panels are screwed to the horizontal panels, the rest is easy. The front driver panel and all the small slot covering baffles are screwed into place with semi-decorative screws. Once all the panels were screwed together, I glued pine trim strips painted black on all the exposed MDF edges, which really cleaned up the look. 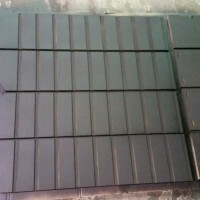 There is nothing extraordinary about the crossover, except that passive networks are usually more difficult with open baffle systems. I think I got lucky, however because that did not seem to be the case with this system. The in-room measurements I took were very well behaved and the drivers quickly fell into 4th order acoustic rolloffs, crossing at 250Hz and 1800Hz. 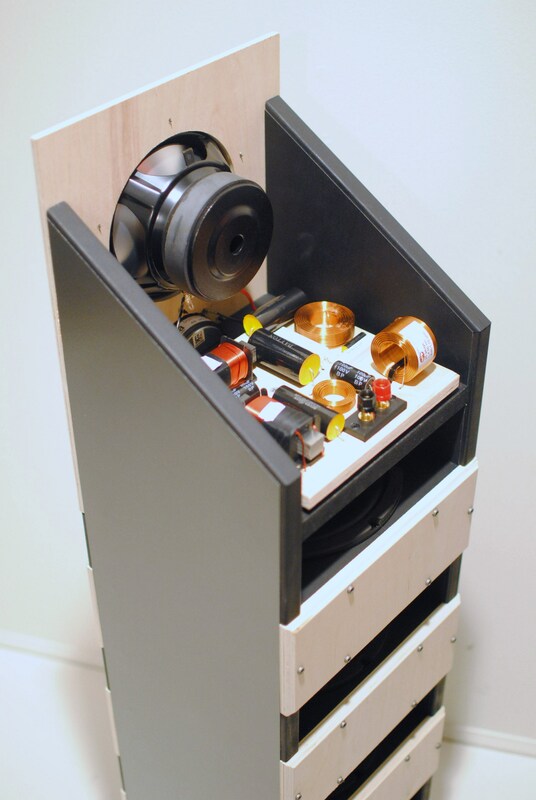 I will say, my first go-round crossed the woofers and midrange at 400Hz with a very smooth measured response, but something was off during listening tests. I believe the resonance from the woofer slot loading was causing some issues in this region that I couldn’t see in the measurements. Moving the crossover point down to 250Hz cleared things up substantially. Also, the dip near 700Hz is real, but relatively narrow band, and getting rid of it introduced more noticeable problems. It was not audible to me in listening tests. This experiment was a resounding success! Every aspect I was unsure of turned out much better than expected. 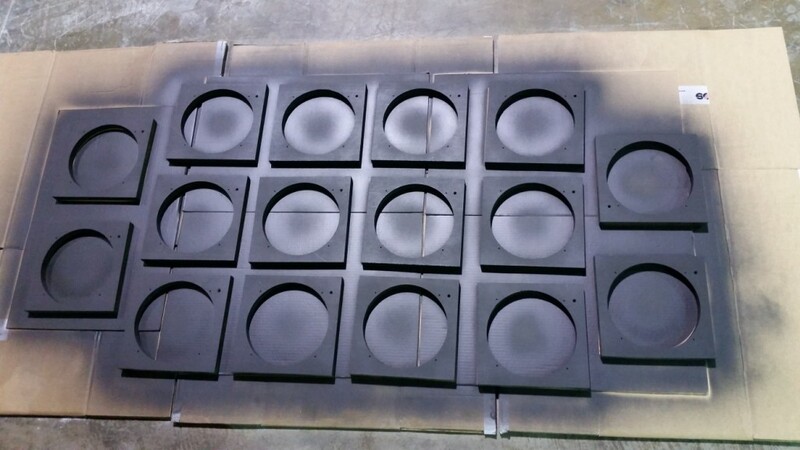 The Hurricanes are a capable open baffle system in a 10″ x 10″ footprint. 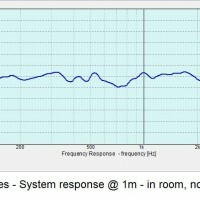 The frequency response measurement shown is in-room and ungated, showing an F3 down near 45Hz and very well behaved low frequency performance. The drivers are value drivers and they sound like well implemented value drivers, BUT they also have that open-baffle magic! Vocals and acoustic bass are open and airy without the usual boxy constrictions of monopoles. 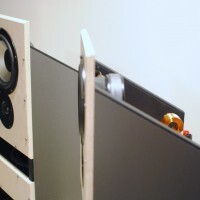 The slot loading actually improved the desired specs for open baffle bass, moving an average Qts from 1.05 to 1.35 when mounted and an average Fs from 65Hz to 48Hz when mounted. 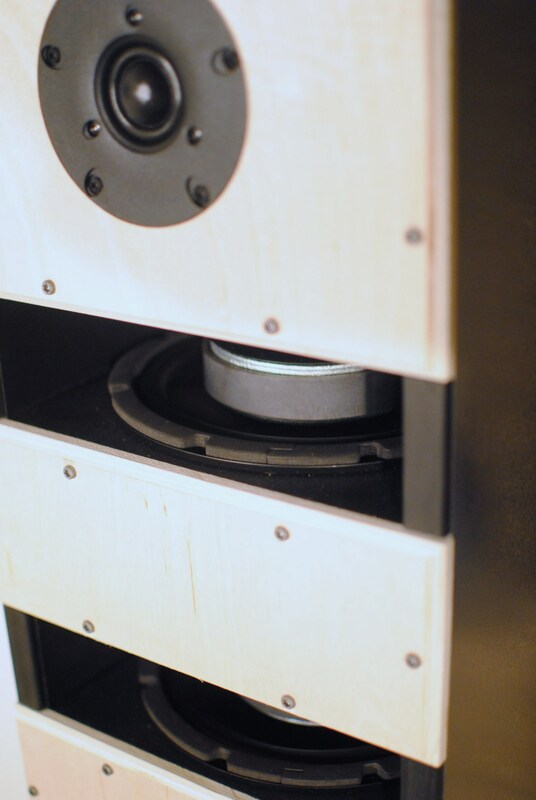 The Dayton DA175 had no problem reaching below the slot resonance to allow the woofers to roll off before they became an issue. 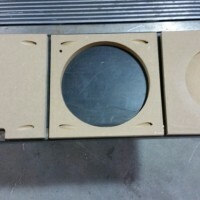 1) Think the construction steps through before proceeding – this enclosure cannot be assembled independently of the woofers. 2) Test the length of the pocket screws first to make sure they don’t disrupt the finish on the outside of the side panels. I ended up using standard 1.25″ drywall screws because they were a hair shorter than the pocket screws that came in the kit, but you should test first before committing. 3) If you want to mount the crossover components on a 3/4″ board as I did, pre-solder some lead extensions to the resistors so they can be accessed on the back of the board. 4) Mistakes can be made easily when wiring the woofers and not so easily discerned due to the nature of the speaker format. Follow the diagram closely. 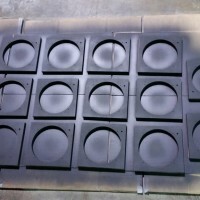 I have been building speakers for over 20 years and am a member of the Parts Express Speaker Design Team. If price wasn’t as much of a concern, would you have chosen a different woofer? What criteria Would I need to look for? I really like the concept of this design, but I want to do my own take on it. I would definitely have chosen a different woofer if cost was not a concern. I outlined the desired criteria above in the driver selection paragraph, but as it turned out, these criteria were not as critical as I thought because the slot loading alters the Fs and the Qts quite favorably for an OB design. A high Qts and a low Fs will result in a lower F3 and a high Vas will result in higher efficiency (and since there’s no enclosure, Vas does not determine “box” size). I think this format has a lot of potential and higher quality drivers would be the first step in realizing this potential. Feel free to send me a private message on the PE Tech Talk forum if you have any questions or just want to keep me updated. I’d be very interested in your progress and results. What would you say the efficiency of these are? You show about 75db at one meter but no power is given. 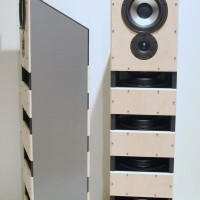 It’s hard to say as the dipole nature of the speakers make it difficult to measure or calculate. My best guess would be around 84dB as they are noticeably louder head-to-head than another pair I have that I would calculate at about 81dB. Really not too bad with everything considered. Intriguing concept for sure. What do you estimate the power handling to be? Again, hard to say, but they seem to have very impressive power handling based on my unofficial testing. 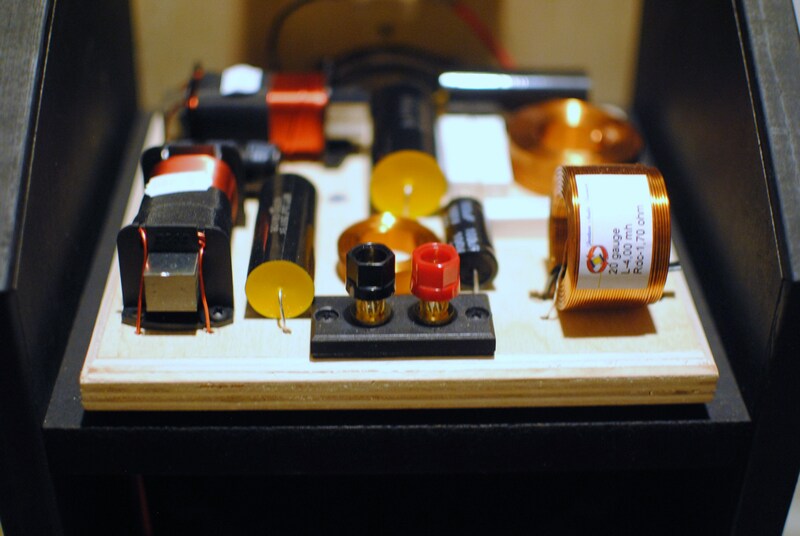 So far, none of the drivers have reached their excursion limits under high power testing and certainly the woofers have not been near their thermal limits either. Using a 300 watt/ch amp, I can play them louder than any speaker I’ve ever tested before. I don’t know what the actual wattage was going to the speakers, but I believe I was using most of the amp. Running at extremely high volume for about 10 minutes, the drivers seemed fine, but I could smell the plywood starting to burn from a couple of the 10W resistors on the exposed crossover beginning to overheat. I would assume that the midrange and tweeter were near their thermal limits as well. Curious what you used to power the towers? You said you used a 300 watt/ch amp, so is that just one channel going to each tower, and therefore 300 Watts total for each tower? I’m not incredibly knowledgeable on the subject but it seems this is somewhat low for subs that handle 80 Watts RMS each and a mid and tweeter with similar RMS handling. I was using a QSC GX3 amplifier during these tests, which is rated to provide 300W/channel RMS into 8 ohms, which is what the Hurricanes are. The midrange is rated for 50W RMS and is operating from about 250Hz to about 1800Hz, which should command at least a third of the frequency dependent power. So if I was using about half of the amp’s power (150W) and one third was going to the midrange (50W), I would be right at the thermal limit of the driver. 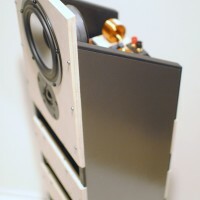 Probably a similar case for the tweeter, even though the published specs say it can handle 100W – there are usually qualifiers for tweeter power handling that make apples-to-apples comparisons difficult. So yes, the 8 x 8″ woofers can handle much more power, both thermally and physically, but probably not before the midrange and tweeter burn up. I was wondering how much this weighed. 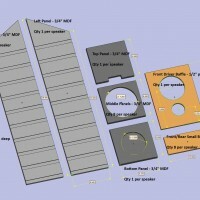 I am interested in compact, full range, loud, high quality PA for my system. Transport in a car. Probably wheels on the back, move them like handtrucks. Rugged but light-weight. It looks like the system you have here could be made to serve – perhaps using 10 or 12 inch woofers. 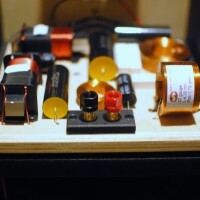 I’m looking for a fairly effortless 130+ db in as small and movable of a package as possible. Is this the concept? I don’t think this is the concept for portable high output speakers. 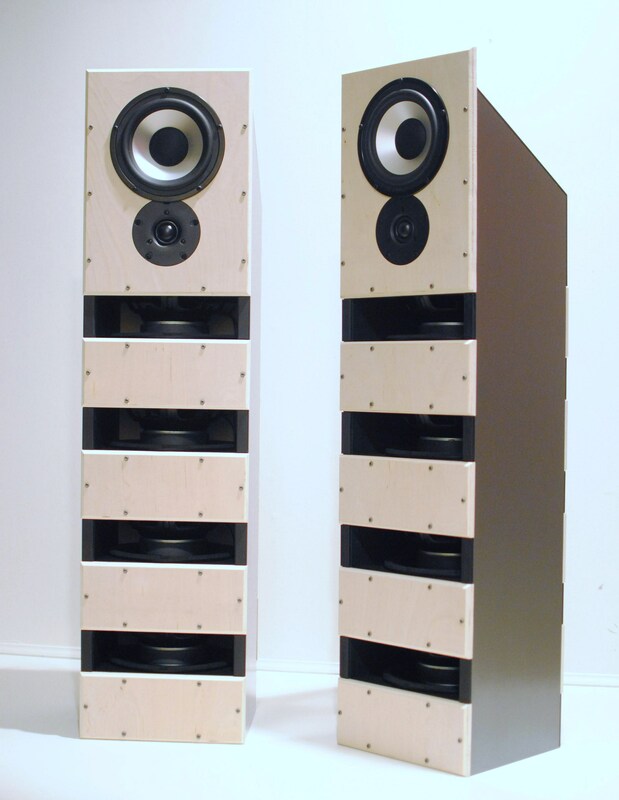 These speakers are achieving open baffle sound characteristics in a small but quite heavy package. 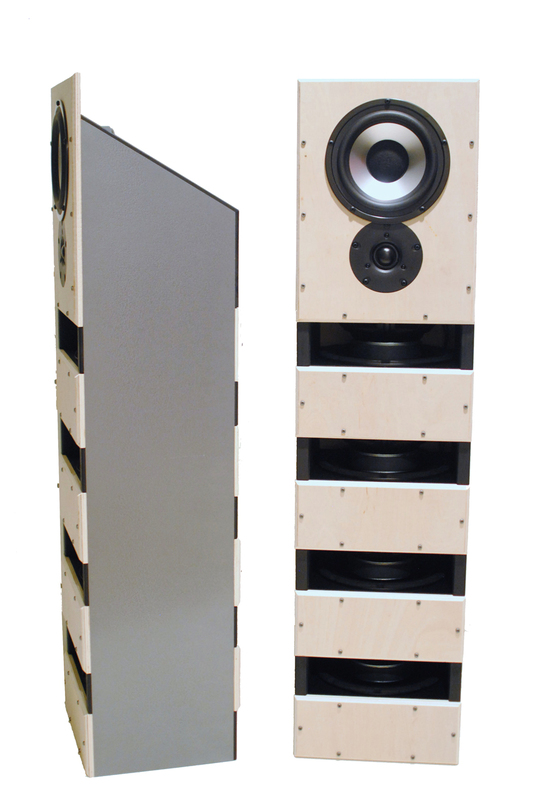 The open baffle nature of these speakers severely reduces the output level in the bass department, which is made up for with multiple woofers. While these speakers can get insanely loud without breaking a sweat, and they are relatively small, open baffle would not be my first choice for a speaker designed for high output. 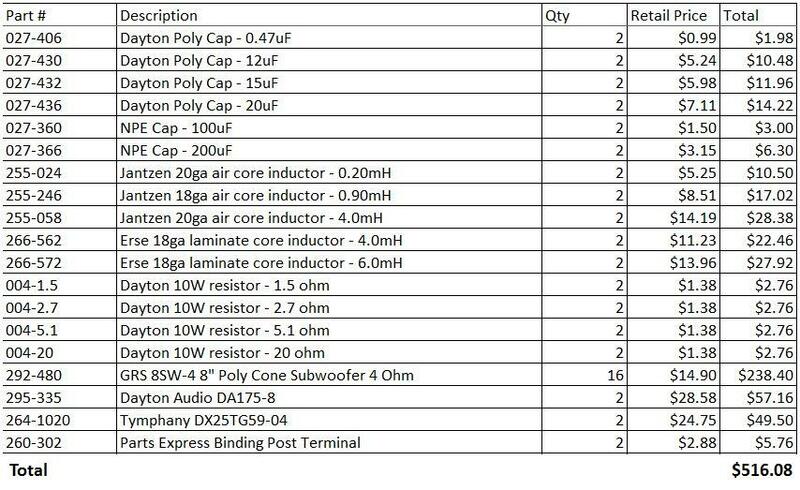 I think you’d have better luck defining your desired low frequency cutoff and box size and finding the pro woofer(s) that best met these criteria in a vented box. Thank you for taking the time to post your project. I came to almost the same idea and was thrilled to see that somebody (you) actually followed through and built it! I was wondering, how did you calculate the number of woofers you needed? I assume, since there isn’t padding on the midrange driver that it is setting the reference SPL. 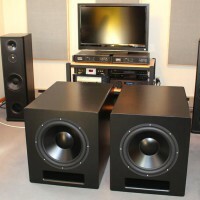 I have a number of 8″ woofers (mcm 55-1190) on hand that are similar in design to the drivers you used. 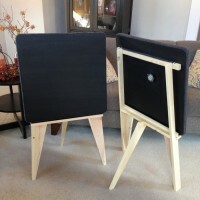 I built a simple single-panel open baffle using 6 of them wired in 3 paralleled series pairs, and was more impressed with the bass quality than any other design I’ve tried with these inexpensive high-Q woofers. They always sounded muddy or boomy in every other style box, but for some reason were very nice open baffle. 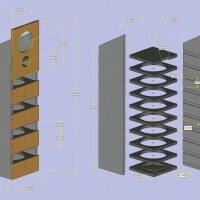 I don’t have the space to use a large open baffle, and was going to build something very similar to your design. I’m not a fan of open baffle midrange drivers. In my testing, they tended to have some combing issues that are very difficult to resolve and left a clearly audible dip in some frequencies (which might be what you have around 700Hz). 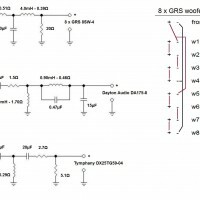 So, to get to the point, I’m trying to figure out what mid / high frequency drivers to mate with the woofer array, and I’m not really sure how to calculate the sensitivity . Could you offer any suggestions, or insight into your design process? That’s a funny story. 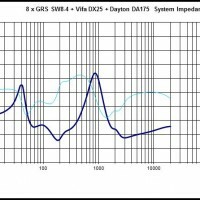 I did attempt to estimate the woofer sensitivity for the exact reasons you’ve stated. 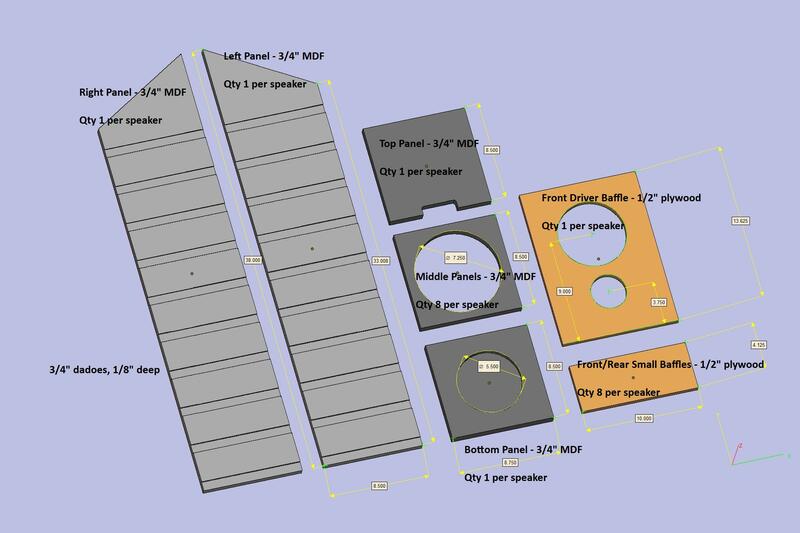 I basically modeled the 8 woofers by estimating the equivalent flat open baffle in Jeff Bagby’s Response Modeler (though I know there are other programs that will do the same thing). In the model, these 8 woofers were very sensitive above 100Hz (like 95dB/2.83V/1m, if I recall) and rolled off quickly below that, so I just picked the frequency and SPL along that curve that I could live with, planning on reducing the level of everything above that to get flat bass out to that frequency. I think I settled on 80dB at 50Hz – not great, but I was just trying the format out. So the plan was to tilt the upper FR down so that it would all be 80dB/2.83V/1m and I’d be flat down to 50Hz and I’d have to pad the mid down. What actually happened when I got it all wired up and measured, was that the woofer FR measured flat in-room to 45Hz without tilting down the top end much at all. So by the time it was all said and done, I just crossed the woofers over below the slot resonance and ended up with better sensitivity than I thought down to a lower frequency than I thought, and I barely had to pad down the mid at all. Not having done any other open baffle speakers, I can’t yet make strong correlations between what I’m hearing and what I’m seeing on the graphs, so I can’t tell you exactly what was going on here, but some of it has to do with the benefits of the slot loading which raised the Qts and lowered the Fs of the woofers vs free air. My best advice would be to get a mid with above average sensitivity and get it wired up and measured. Worst case scenario you’d have to pad down the woofers, which isn’t the worst thing with open baffle as it will just raise the Qts even more. 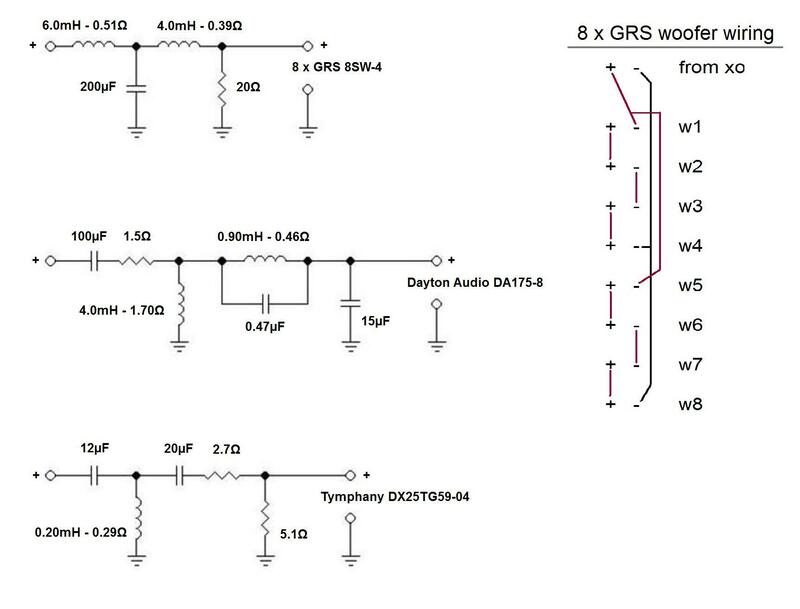 Would it be possible to use less woofers, say 4 or 6? This format is very flexible and 4 or 6 woofers could work great. 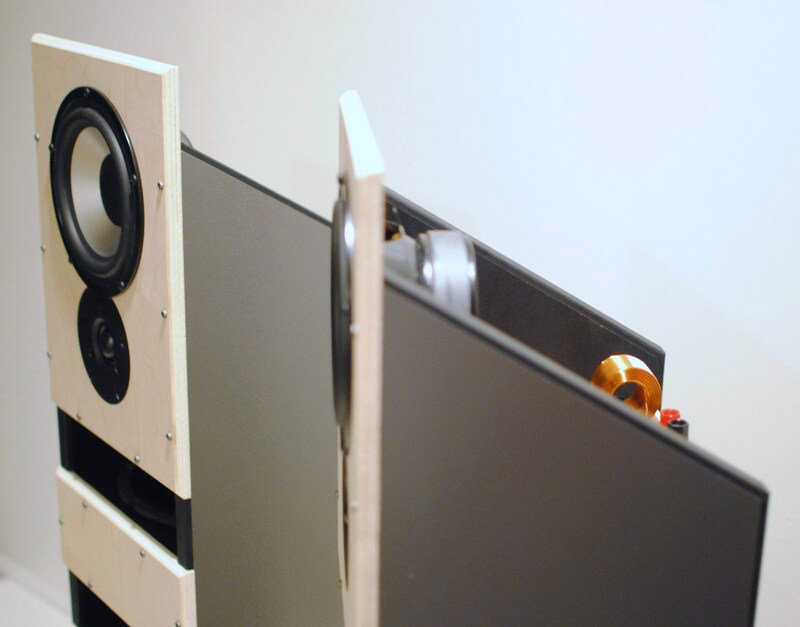 I chose eight 8″ woofers because it was the most surface area I could pack in that height and width. 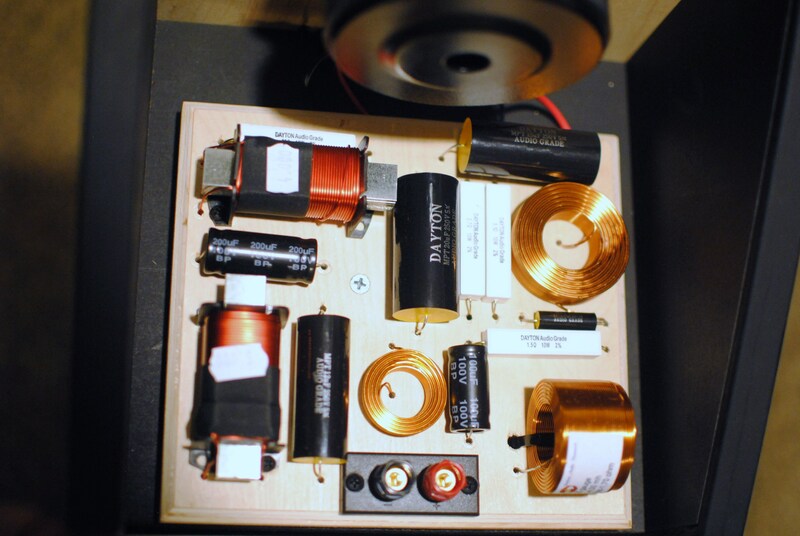 More or less woofers will require a different crossover though for optimum integration with the midrange and tweeter.